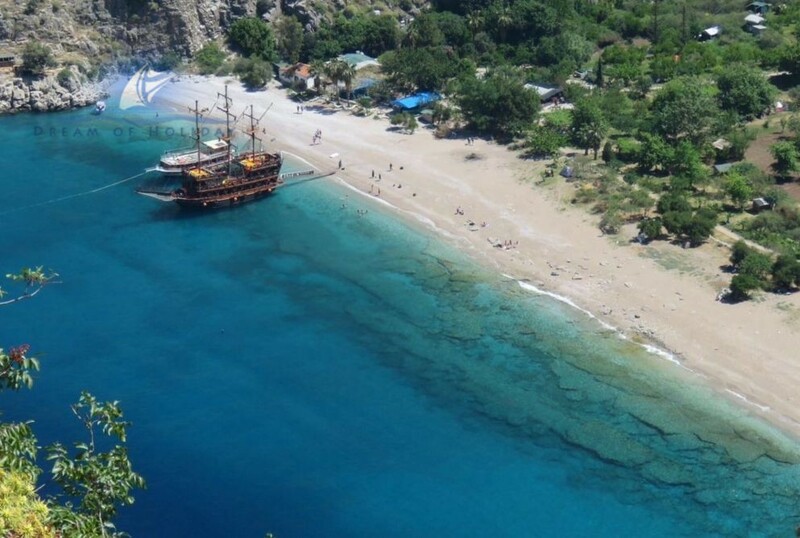 Fethiye is a tourist town with an international atmosphere. It has an excellent marina and good night life. The town also serves as an excellent base for touring the inland country-side, and is probably the only city in the world where you'll find sarcophagus in the streets. These pre-Roman Lycian relic s are especially spectacular when floodlit at night. The town has a population of around 50,000 but the population increases dramatically during the high season, from April to end of October, when off-shore residents spend their summers at their second homes. Summers are extremely hot with temperatures well above 40°C in July and August, you should drink plenty of water to keep hydrated which is important in a very hot place such as Fethiye. Winters are cool with temperatures around 14-20°C. Spring and Autumn are the wettest seasons, yet still very sunny, which is the best time to go for people who want a warm holiday that is not too hot like the summer, with temperatures around 20-28°C. Saklikent Gorge — — a stunning geological site located inland on the Teke Peninsula (between Fethiye and Antalya), about 40 km southeast of Fethiye. This is a great place for a leisurely hike. If you want to explore the gorge a bit further upstream, be prepared for some clambering and getting wet! Kayakoy Village — It is a hiking destination, these are the ruins of a Greek settlement abandoned in 1923 when the governments of Turkey and Greece mandated population swaps. It features some well-preserved structures, including a church. The village and the beach by the lagoon was locally known as Belcekız or Belceğiz before the area became a magnet for mass tourism. Although today many people in the area have no idea about what Belcekız is and the town as well as the lagoon are both known as Ölüdeniz, which literally means "dead sea" and originally referred only to the lagoon itself. Butterfly Valley — An isolated canyon bordering the seashore to the south of Fethiye. It features waterfall. Butterfly Valley is hippie haven situated in a narrow canyon with almost no overland connection to the rest of the World.